This sumptuously satisfying form is part of a large range of ovoid shapes that form a staple for the snuff bottle, although this particular variation is rare in not being compressed in any direction. It could be seen as a manipulated sphere, in this case stretched vertically, but it is more likely to have been derived from the ubiquitous egg. As a rule, a bottle of this extended ovoid form would either be compressed to some extent, to provide two main and two narrow sides, or have a partially straight-sided vertical profile, bringing it closer to a manipulated cylinder. That it does not, but is completely cylindrical in horizontal cross-section, gives it immense presence. It is generous, expansive, and supremely confident, like a portly and learned favourite uncle. 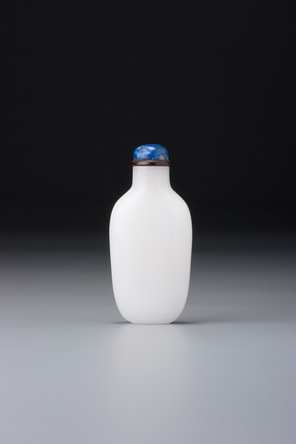 It follows the standard rule for snuff bottles with both a neck and a foot, in that the neck is narrower than the foot, giving greater functional and visual stability (see discussion under Sale 4, no. 17). The choice of form was a masterstroke for this material. Chalcedony with this internal pattern, resembling light filtered onto sand through shallow water, or clouds, or fish-scales, or perhaps even cracked ice, was undoubtedly highly valued. It frequently appears in plain bottles of faultless technical and formal perfection, such as this. The completely plain but unusual form emphasises the material and the continuous curve of the surface encourages turning it endlessly in the hand, constantly changing the subtle but richly varied markings. 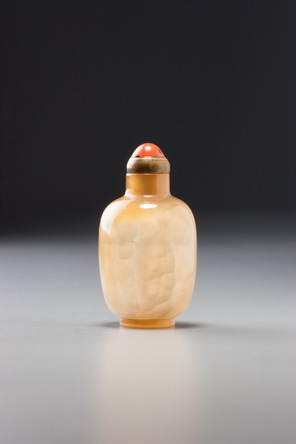 In its simplicity of form, superb detailing, and choice of material, this bottle is probably linked to, among others, Sale 5, lot 77, which has the hallmark of Yongxing, (1752–1823), the eleventh son of the Qianlong emperor, allowing a tentative palace attribution for this example.